A Pius Geek: REVIEWS ARE IN FOR HONOR AT STAKE!!!! 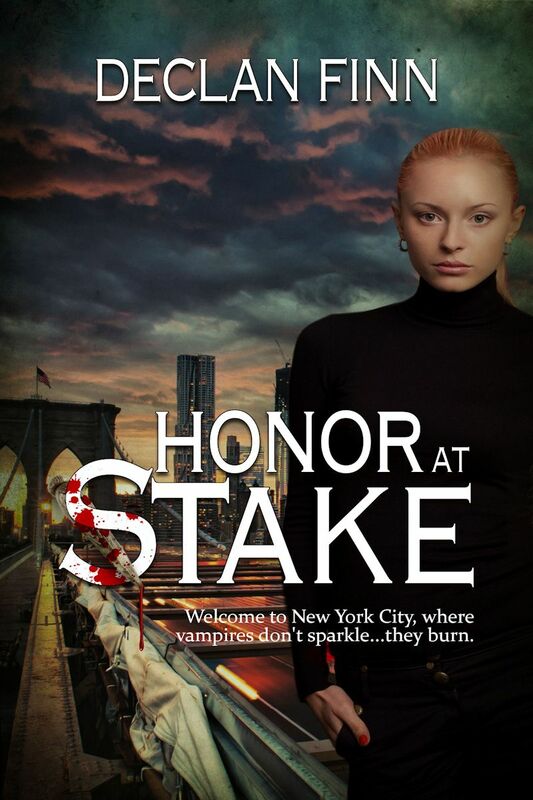 So, being slightly over prepared, I sent out a few advanced copies of Honor at Stake. Most of these were either for the sake of blurbs, or for reviews. So some I can link to, some I can't, since they were sent to me directly. "OM... you did NOT do that! You did NOT just leave it at that! I think I hate you! Gaaaaahhhh!!! I still can't believe you did that!! *thud* I was just sitting here, into the home stretch, telling my husband, "You know, I don't like vampire stories much, but this one is so different... the action, the theology even, and the romance is so... so... NOOOOOO!!!!" Can't wait for the sequel and I'm highly recommending it when it's released!" Other review, from Karina Fabian, who I think is getting back at me for something...okay, she's not, she sort of does puns on a reflex. "When Vampires try to take a bite out of the Big Apple, they'd better watch out. From street gangs to the Mafia to Vatican ninjas, the best and the worst of humanity bond together to save their city. Finn is a master of the fight scene and nonstop action - Honor at Stake will leave you feeling sucked dry." From Lori, one of my cobloggers at The Catholic Geek. As of this minute, the full review is on Amazon. 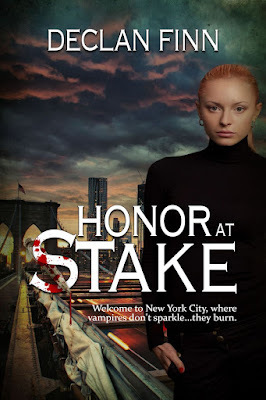 "Honor At Stake is what happens when a monster-killing action flick meets a solid romance and a compelling character study in a world where "good vampires" actually make sense. It is thoroughly enjoyable, and I can't wait for another installment." It's strange when people actually tell me they WANT another book. Huh. Remember Dawn Witzke? The Guest Puppy? She did a whole review. But, some highlights? Declan uses a good mix of show and tell to create a unique voice and awesome story. He does an impeccable job of balancing the action, suspense and romance. Usually, you get one with a side of the others, but not in this book. All three are served up in equal shares. The “rules” for vampires are consistent. Declan does stray from the original vampire lore, but not so much that it’s not believable, unlike a book with sparkley vampires. There are Vatican ninjas involved and they have cool toys. The romantic scenes are very well done. Declan has a rare gift to be able to write romance scenes that women actually want to read. Men usually fall short in that area. There are hooks throughout that force you to keep reading because you just have to know what happens next. Did I mention there are ninjas? Oh, and fencing and krav maga and explosions and loads of other fun stuff. And finally, there is a review from Margot St. Aubin, who read several versions of the book before I submitted it anywhere. then there was Twilight. Sure, an enthused friend handed them to me. She did a fine job of convincing me they were awesome. They weren't. Then Declan Finn comes out with Honor at Stake. Dammit, I thought I was over this. I'm even hauling out my Rasputina and Black Tape for a Blue Girl thanks to his guy. He already knows he's responsible for all the Cruxshadows appearing in my playlist. And, he's not sorry at all. That's a good thing. It will be all his fault if I start wearing black lipstick again, I swear. Okay, I'm joking about that last part. No, seriously, this guy writes about... ahem, real vampires, not the sparkly fucked up Jar Jar Binks of the vampire world. They are deadly hunters, with vestiges of humanity that make them more frightening."" Er... got the book through Kobo. The blasted thing is a DRM'd PDF and, apparently, Kobo doesn't give advice prior to clicking (*). Color me using 4-letter words in full Latin-blooded restrain. Gah. Well, that's disheartening. I'll see what I can do.